Readers first met the irrepressible Waverly Bryson in Perfect on Paper, and now the woman dubbed by fans as “the American Bridget Jones” is back in a sequel packed with friendship, heartache, and romance. 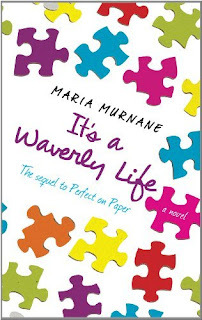 In It’s a Waverly Life, the formerly heartbroken singleton is now happily enmeshed in a new relationship, a new job, and a new decade. Her career as an advice columnist is taking off, and the future of her fledgling greeting-card line is bright. Of course, where Waverly goes, drama is sure to follow, and this time is no exception. Her broken engagement to former fiancé Aaron Vaughn has left her gun-shy when it comes to love, putting strain on her long-distance relationship with handsome Jake McIntyre. And when her best friends McKenna and Andie both make life-changing announcements, Waverly fears she is being left behind by the ones she loves most. In true Waverly fashion, things must get comically worse before they can get better. But in the end, she discovers that though life (before and after thirty) may be messy and unpredictable, friendship and love make it all worthwhile. Looking for a main character who will make you laugh and shake your head at the same time? This is the book for you. Waverly is always surrounded by drama, some she creates herself and some she seems to walk into. She finally seems to have her life back on track. She has a new boyfriend and her job is doing well. It doesn't seem to be long, though, before new complications begin popping up. Will Waverly find a way to control the drama or will it take over her life? As a character, Waverly is very good at interacting with the reader. She's a bit of a sympathetic character, the reader is likely to feel sorry for her numerous mishaps and mistakes. However, she can also be silly, kind, and smart; she is a likable character. The secondary characters round out the novel, filling in the plot gaps and giving Waverly more material to work with. The dialogue is engaging and fun to reader, the reader will find that the dialogue moves the plot along quickly. This book is a fast-read, the reader will want to discover what Waverly is up to and if it will work out. The events were interesting enough, every once and a while there was a slight lag, but not much of one. The ending was perfect, fit perfectly with Waverly's typical reactions. This book is recommended to adult readers.